One of the most famous descriptions of a coyote — which was also known as a “prairie dog” by Lewis and Clark — was written by Mark Twain in his 1872 book, Roughing it. For those who have not read it yet, here it is. Twain goes to the extreme to wake up the reader, using over-the-top satire for effect, to depict a standard negative view of coyotes held by Americans at the time. The brilliant irony is exquisite: Clemens sullies and defiles a coyote’s “sorry looking aspect”, but in the end he shows his admiration for the coyote who gets the last laugh when put up against any dog, and wishes him the best. The so called “miserable looking creature” is actually an intelligent, brilliant survivor. Along about an hour after breakfast we saw the first prairie dog villages, the first antelope, and the first wolf. If I remember rightly, this latter was the regular coyote (pronounced ky-o-te) of the farther deserts. And if it was, he was not a pretty creature or respectable either, for I got well acquanited with his race afterward, and can speak with confidence. The coyote is a long, slim, sick and sorry-looking skeleton, with a gray wolfskin stretched over it, a tolerably bushy tail that forever sags down with a despairing expression of forsakenness and misery, a furtive and evil eye, and a long, sharp face, with slightly lifted lip and exposed teeth. He has a general slinking expression all over. The coyote is a living, breathing allegory of Want. He is always hungry. He is always poor, out of luck, and friendless. The meanest creatures despise him, and even the fleas would desert him for a velocipede. He is so spirtless and cowardly that even while his exposed teeth are pretending a threat, the rest of his face is apologizing for it. And he is so homely! -so scrawny, and ribby, and coarse-haired, and pitiful. When he sees you he lifts his lip and lets a flash of his teeth out, and then turns a little out of the course he was pursuing, depresses his head a bit, and strikes a long, soft- footed trot through the sagebrush, glancing over his shoulder at you, from time to time, till he is about out of easy pistol range, and then he stops and takes a deliberate survey of you; he will trot fifty yards and stop again- another fifty and stop again; and finally the gray of his gliding body blends with the gray of the sagebrush, and he disappears. All this is when you make no demonstration against him; but if you do, he develops a livelier interest in his journey, and instantly electrifies his heels and puts such a deal of real estate between himself and your weapon that by the time you have raised the hammer you see that you need a Minie rifle, and by the time you have got him in line you need a rifled cannon, and by the time you have “drawn a bead” on him you see well enough that nothing but an unusually long-winded streak of lightning could reach him where he is now. But if you start a swift-footed dog after him, you will enjoy it ever so much- especially if it is a dog that has a good opinion of himself, and has been brought up to think he knows something about speed. The coyote will go swinging gently off on that deceitful trot of his, and every little while he will smile a fraudful smile over his shoulder that will fill that dog entirely full of encouragement and worldly ambition, and make him lay his head still lower to the ground, and stretch his neck further to the front, and pant more fiercely, and stick his tail out straighter behind, and move his furious legs with a yet wilder frenzy, and leave a broader and broader, and higher and denser cloud of desert sand smoking behind him, and marking his long wake across the level plain! And all this time the dog is only a short twenty feet behind the coyote, and to save the soul of him he cannot understand why it is that he cannot get perceptibly closer; and he begins to get aggravated, and it makes him madder and madder to see how gently the coyote glides along and never pants or sweats or ceases to smile; and he grows still more and more incensed to see how shamefully he has been taken in by an entire stranger, and what an ignoble swindle that long, calm, soft-footed trot is; and next he notices that he is getting fagged, and that the coyote actually has to slacken speed a little to keep from running away from him- and then that town dog is mad in earnest, and he begins to strain and weep and swear, and paw the sand higher than ever, and reach for the coyote with concentrated and desperate energy. This “spurt” finds him six feet behind the gliding enemy, and two miles from his friends. And then, in the instant that a wild new hope is lighting up his face, the coyote turns and smiles blandly upon him once more, and with a something about it which seems to say: “Well, I shall have to tear myself away from you, bub- business is business, and it will not do for me to be fooling along this way all day”- and forthwith there is a rushing sound, and the sudden splitting of a long crack through the atmosphere, and behold that dog is solitary and alone in the midst of a vast solitude! The coyote lives chiefly in the most desolate and forbidding deserts, along with the lizard, the jackass rabbit, and the raven, and gets an uncertain and precarious living, and earns it. He seems to subsist almost wholly on the carcasses of oxen, mules, and horses that have dropped out of emigrant trains and died, and upon windfalls of carrion, and occasional legacies of offal bequeathed to him by white men who have been opulent enough to have something better to butcher than condemned Army bacon…. He does not mind going a hundred miles to breakfast, and a hundred and fifty to dinner, because he is sure to have three or four days between meals, and he can just as well be traveling and looking at the scenery as lying around doing nothing and adding to the burdens of his parents. We soon learned to recognize the sharp, vicious bark of the coyote as it came across the murky plain at night to disturb our dreams among the mail sacks; and remembering his forlorn aspect and his hard fortune, made shift to wish him the blessed novelty of a long day’s good luck and a limitless larder the morrow. This coyote warmly and enthusiastically welcomed a newcomer into her territory a while back: the territory would now be “theirs”, and not hers alone. Since that new inclusion, she and he could be seen teasing and bantering with each other constantly, including where food was involved, such as with a mouse. Who ultimately won the mouse was less important than the good-willed bantering over it — the interaction. They became best friends and, although they would go off in their own directions to hunt, they would “check-in” with each other at regular and frequent intervals, with joyous shows of affection, playfulness, and camaraderie. SO, it was a bit of a surprise to discover that she had found a dead raccoon and kept it all to herself as far as I have ever saw. Although coyotes are able to take down juvenile raccoons, more than likely she found it as road-kill. I say this because this coyote actually flees from cats which are about the size of raccoons and much less ferocious. It was when her new companion was way across the park that I found her in this spot, alone, eating her fill from the carcass. I went back to check on the other coyote: he was still hunting on the other side of the park. By the time I returned half-an hour later, this crafty trickster was hiding/burying her carcass by covering it up so no one would find it. I only saw her return there when he’s not with her, and I never saw him there. Burying the carcass by covering it with leaves, using her snout, and looking around to make sure no one sees her [photos above, video below]. When I have observed other coyotes share the meat of a raccoon, they usually do it sequentially, with the dominant coyote driving off the other until that coyote has had its fill, while the second coyote respectfully sits and waits some non-intrusive distance away, pretending disinterest, until the first coyote departs. After the second coyote has his fill, the remains of the carcass are often dragged into a better hiding place by the second coyote (the first coyote having departed). It is common for coyotes to find what another coyote has buried, unearth it, and drag it to a new hiding place where only they can find it. Of course, this could then again, happen in reverse. When parents travel with their youngsters, you would think they might make sure the youngsters get their fair share of any found food. Nope. I’ve seen parent coyotes glutinously and selfishly devour an entire cache of food — too bad for the youngster who sat back and watched. Writer Vanitha Sankaran from Pacifica Magazine recently contacted me requesting an interview and photos of coyotes for an article she wanted to do. Coyotes were being sighted more frequently in Pacifica, so it was an opportune time to get some information out to the public. I was, of course, happy to do this. 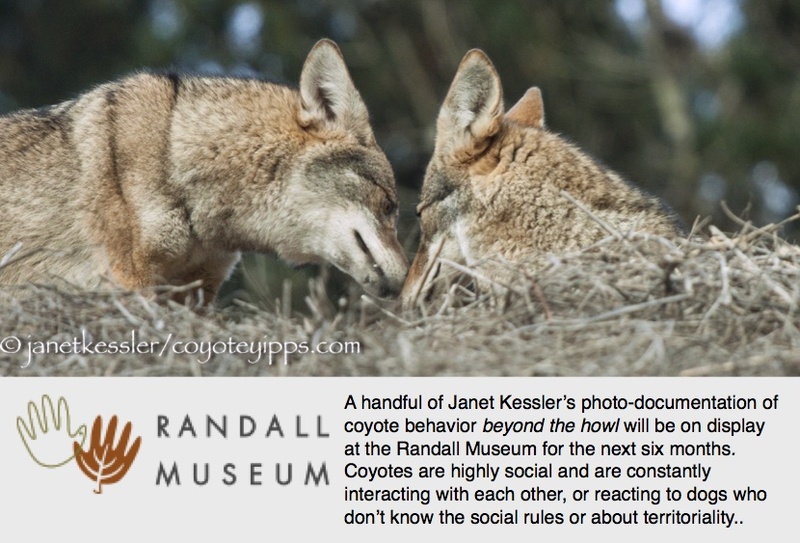 Here is her article, capturing how and why my passion began and grew as I discovered the extent of individual coyote personalities and the profusion of family interactive behaviors, along with the simplest basic guidelines for coexistence. Reproduction of the photos appear a little grainy in these online versions, but that several depict strong social interactions is very clear. Hopefully the article will help open the door to recognizing that there are commonalities between species vs. “denying these similarities because we’ve been told that animals couldn’t possibly have qualities or social drives that humans have”. Recognizing a kind of parallelism will help you relate to them better, and help you possibly appreciate who they really are. Feedback I’ve been getting: The writeup is fun and informative! :)) I’ve included the above embedded copy of the article from Pacifica’s website, and a link to a PDF version, below, which might be easier to read. I was invited to talk about coyotes at the Lindsay Wildlife Center in Walnut Creek on Monday. I gave a 94-slide presentation, put together specifically for this audience, based on my first-hand observations and illustrated with my own photos and videos, and then we had comments and questions afterwards. I spoke about what I do: first-hand researching and photo-documenting urban coyote behavior and family life and their interface with people and pets for the last 11 years in San Francisco and disseminating this to the public, and then I continued with what I have learned first-hand: typical coyote characteristics and their individuality, their family behaviors and communication, their population dynamics and movement into urban areas, coyotes and pets, and finally the social interface of which we humans are a part, along with how best to coexist with them through education and minor habitat adjustments. Above are nine of the 94 slides I used as starting points to discuss behaviors and guidelines. For instance, one of coyotes’ normal behaviors (slide 45) is their routine trekking through the neighborhoods after their evening rendezvous: they travel beyond parks, where they survey, hunt, mark and continue to socialize. Being in neighborhoods is not “wayward” behavior — it is totally normal behavior in dense urban areas and should be expected by everyone living in urban settings, especially by those living close to parks or open spaces. It is a territorial behavior and has little to do with the amount of food and water available to them in the parks: so changing the resources or configuration of these resources within the parks (as was offered as a solution for keeping them out of the neighborhoods by someone) is not going to thwart them from trekking through the neighborhoods. There is more to coyotes than just their stomachs! Below are a few photos of the event. Thank you Lindsay Wildlife Center volunteers for inviting me: it was an honor to share this information with you! Might this be a yoga pose? Hi, Janet. Today I saw my first coyote in daylight !!! It was in Pacifica. At first I thought it was a dog. Or a wolf. I even looked at your website’s pictures just to make sure it really was a coyote. You note on your website that, “Everyone I know is as thrilled as I am to have them here, even if they’ve never seen one!” And I know that’s true of me! I want them to keep sharing the habitat we still have. I am a defender of the coyotes. Seeing the coyote today was an enormous thrill for me. I also took pictures of a huge flock of quail in Pacifica today and recently I photographed my 37th California butterfly and that was in Pacifica too. It was a Satyr Anglewing. I really enjoy your coyote pictures. Another yoga position — and he held it for a long time! For variety, occasionally I write about other animals than just coyotes — and this post is about one of these non-coyote animals. I found the Red Tailed Hawk fledgling I wrote about several weeks ago playing or practice-hunting with a rock. I had never seen anything like this before and wonder how ordinary, or quirky, or super-intelligent (or the opposite) this behavior is to be able to play like this? Then again, maybe it’s an indication of character, individuality and special interests as in anyone else — why not? She was persistent in her play and really fun to watch — almost as fun as watching the coyotes! A few days later, I saw her playing this same way with a pine cone, and before that I saw her attacking a gnarled twig on the ground as though it might be a something edible. Addendum: I spoke to our local bird specialist, Dom Mosur, who told me that this is normal behavior, that hawks indeed do play with rocks!! I didn’t watch the fireworks on the 4th, I watched what was going on around them. Here is a two-day drama with many photos (54) for raptor lovers: a photo essay. This story is not about coyotes, except for the fact that they were there. Occasionally I vary my blog with non-coyote stories. As I arrived at one of my parks for observations, I heard the cries of a young hawk. They were loud and plaintive, insistent and incessant. I watched the little fellow awkwardly move along the fence-line and then into some dense bushes. The screaming went on and on and on. He seemed desperate: he didn’t like his situation, but seemed unable to do much about it. Then I heard another cry. A deeper and calmer cry in shorter bursts. I looked out into the distance, and sure enough there was Mom in a tree. You can tell who Mom is by her deep reddish/brown and dark coloring, as compared the the youngster who was speckled brown and white, with a white bib. I wondered why she didn’t come over to help. She stayed in the distance, several hundred feet away, and appeared to be eating something. Then, she batted her wings and began to fly. She had a huge piece of prey in her talons. I was hoping she would bring it to the youngster in distress. But, no. Amazingly, NO. Instead, she flew back and forth between various trees, carrying that huge piece of prey, as the youngster cried and cried for help or food. Mom seemed to be trying to get the youngster to come to her, enticing it with food. It was obviously a fledgeling: this bird was not depending on its wings. Mom continued flying from tree to tree with the prey for a few minutes, and then she landed on a far tree branch where I almost couldn’t see her. But the camera still could pick up her image, and it showed that, at that tree branch there was yet another youngster, and she was now feeding that one, and letting the other one continue to screech — that one was perched on a thick and solid branch. The screeching youngster was in a flimsy tree, with no place for Mom to land, and maybe this is why she didn’t try there. By this time our youngster had worked his way from the high bushes to the tree they grew around — it looked like it required a leap of faith on his part. Once there, he hopped and walked — as though balancing on a tightrope — from branch to branch, higher and higher up in the tree, all the time crying its little heart out. I could see that the effort was tremendous, and the bird fell to lower branches several times. I imagined myself trying to do what the bird was doing, without the use of my arms — it was a tremendous balancing act. And now, no sign at all of Mom, and the day was waning into darkness. Fireworks were exploding in the distance — I could see how much the “booms” disturbed the animals, no different from the effect on domestic dogs, except domestic dogs have owners who will take them indoors. A male coyote dashed for cover into the bushes after a loud fireworks explosion. I read where one city was now only allowing silent fireworks — what a great idea for the wildlife and dogs! As the loud and incessant noise continued — booms from fireworks and distressed hawk cries — I spotted little hummingbirds — so very tiny compared to the baby hawk — flitting around the hawk and trying to console it? Or maybe they didn’t like the noise? I’ve seen hummingbirds do this to coyotes who are howling and yipping in distress after having been chased by a dog — no more than 2 feet away and right up to their faces: maybe they pick up on the mood of the distressed animal. The hummingbirds had been around the youngster hawk for an hour now. Then it was dark. The cries became less and less frequent, and finally stopped. Hawks do not operate at night, so the story would have to continue in the morning. At night there is danger to young hawks from one animal: owls. But I hadn’t heard any, so maybe they weren’t in the area. I returned to the park before dawn the next day and all was still quiet. But as dawn broke, the incessant cries of the youngster could again be heard. I found the tree where the sounds were coming from — he was still in the same tree — but I could not see the youngster itself hidden in the tangle of tree foliage. And I could hear the other youngster again. I could not see Mom. Somehow I knew that Mom would end up feeding the hungry little fellow — both of them. I knew that this was routine drama that all wildlife has to cope with. It was calming to conclude this, but the event was high drama to me anyway. The coyote who had been scared by the booms of fireworks now appeared. He was making his daily rounds. It was a new day. I moved on to other parks. In the evening I returned. I was greeted by the coyote who appeared amused that my attention was absorbed by the bird drama: he looked at me quizzically. Coyotes are much more aware of what is going on than most people think — including of intentions. He curled up not far from me to sleep in the sun and probably keep an eye on me. As the coyote did this, the hawk drama continued. Mom now flew again with more prey towards the fledgeling, but it was futile. The youngster had not moved in 24 hours. He was out on a weak limb and she could not land there, which probably didn’t matter anyway since she was trying to get him to come to her, maybe to use his wings. So she perched in a nearby tree and waited. She was in clear view of the fledgeling and so was the piece of meat. If he wanted it, he would have to come get it. Her situation was not easy: she had to be patient and sit there, and she did so for 2 hours as I watched, as scrub jays heckled her. Their skydiving her and screeches were mostly of an intimidating nature, but one actually pecked her head. AND, the hummingbirds were back to watch the show or offer solace. And then two things happened. Out of the blue, the other youngster appeared and awkwardly landed on top of Mom who held the meat. They became hidden from my view within the branches of the tree so I could not see the details of what was going on. And, our youngster exerted himself again and was able to hop/fly to that tree which was about 25 feet away. Once in the tree, and still crying incessantly, he hopped from branch to branch, slowly, eyeing Mom and moving towards her. And then suddenly he, too, made another tremendous effort and jumped on Mom, so now there was a pileup of large awkward hawks on a flimsy outer pine tree branch, causing the branch to sag and the fledgeling to slip. This was lucky for me, because now I could see a little of what was going on. Within seconds our fledgeling was hanging by I know not what (the branches of the tree pretty much concealed just about everything), with the large piece of meat dangling below from his talons. This is the precarious dangling situation from which he is able to extract himself without letting go of the prey and without falling to the ground. Pretty cool! Finally! Gulping down some food! He had made the effort to come to Mom, which is what she appeared to be angling for, and had wrestled the piece of meat from his sibling! Wow! He proceeded to extract himself from the dangling situation, and then I noticed a change. It was QUIET. The incessant crying had stopped for the first time in 2 days (except for nighttime). From then on until dusk I only heard an occasional shorter cry, not at all like the previous cries, not distressed and desperate. So, all in a day — or 2 days.